Most of the chaps at the yard had been on a weeks holiday somewhere hot. This either meant that not much progress would have happened since we were last there or a lot would have happened. It was the latter. First we had a catch up on the battery front, more conversations had been had with the Lithium Battery people and Mick and I had put together a power audit. The audit was based on a winters high usage day. Without running the engine we reckoned we’d use about 82 Amp hours of power. The suggested batteries may be enough as it would be unlikely for us to not run the engine on such a day. Ken and Ricky will put together the prices so that we can decide if we can afford the greater initial outlay. More fabric samples had arrived and luckily there was one that stood out from the rest for the dinette covers. This and others were taken down to Oleanna to see what they would look like in situ. A lot had happened since our last visit, although everything was just placed in position for us to see as the floor is still to be laid and the ceiling will go in shortly. It’s most probably best if I talk through photos from the stern. Carcasses have been made up for the cupboards at the stern. From the furthest back on the starboard side working forwards. 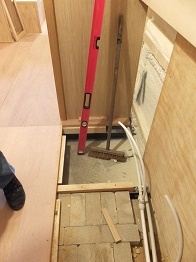 The electrics cupboard above a cupboard which is challenged by the swim of the hull, this will be for deep storage. 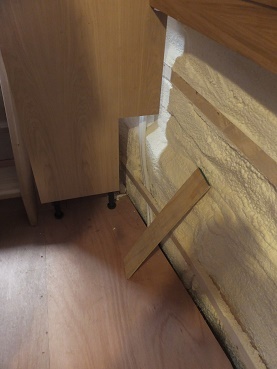 The cupboard door for the electrics cupboard will open above the rear steps. The next unit will mainly be drawers. 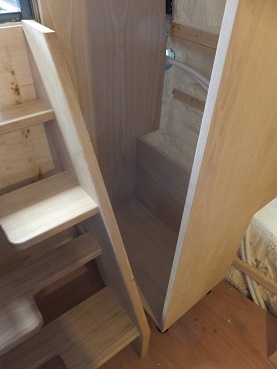 Our current boat has drawers that are high enough to hold a bag of flour, so we have two such drawers, a cutlery drawer, T towel drawer then a deeper drawer at the bottom and a cupboard filling what space there is left at the top. Next will be an undercounter pull out larder unit. Next to that will be a slimline dishwasher. This is the port side. 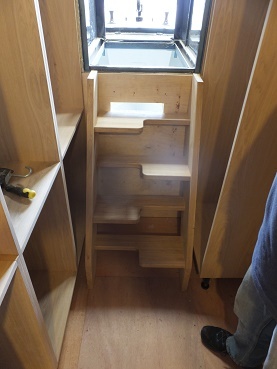 A long cupboard with hanging space accessible from above the steps. The base of this will be where we keep our second folding bike, which comes out on rare occasions. The top of this unit will have an open shelf so if/when the heavens open we can pop things there that we want to keep dry. 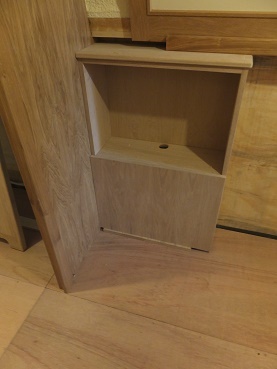 There will be a shelf in the cupboard for the tool kit. The stern steps are half steps or loft steps. We have these on on NB Lillyanne and really like them as they take up less space but don’t feel as steep as normal treads would. They have however been made with the leading step the opposite way round to our current configuration, so we shall have to be careful for a while. Our standard “Go in backwards, right foot first” will have to change. Next to the tall cupboard is where there will be a slot left for our other folding bike. This will sit above a cupboard or drawer lifting it as high as possible under the worktop. This is so that the bike can nestle as close to the swim as possible without sticking out too much. We wanted the bike to be in a handy position. Following on from this will be the fridge, then the cooker, then some angled shelves. Following on from the dishwasher will be the sink unit with the drainer going into the corner. 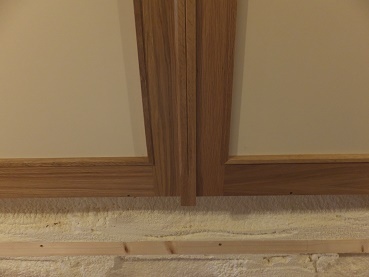 The triangular cupboard will house crockery etc. 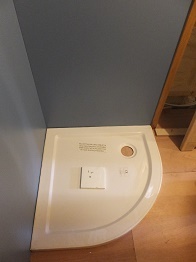 This will be able to slide along the half bulkhead behind it so that you can get access into the cupboard in the corner. I’m hoping that the corner cupboard will have a couple of pull out shelves/ drawers to make access even easier. All these units are on feet and there will be a plinth below. 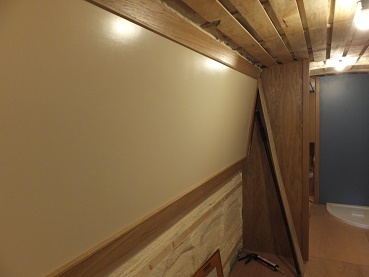 The cabin sides have been clad with painted birch ply and framed simply with oak. The ceiling has yet to be clad in a similar way. This can only be done when the electrics have been routed to where they need to be. 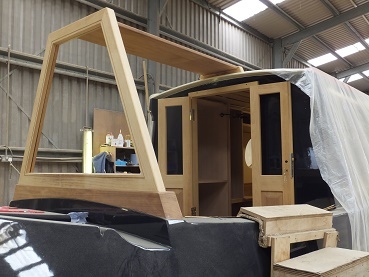 Between each panel is a joining strip which covers the join, this also allows there to be a small gap for expansion and contraction of the cabin sides. It has a simple detail of a grove down it. 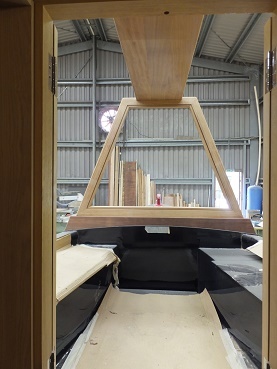 Other boats we’d seen in fit out had much more detailed panelling, but I preferred it to be simpler. 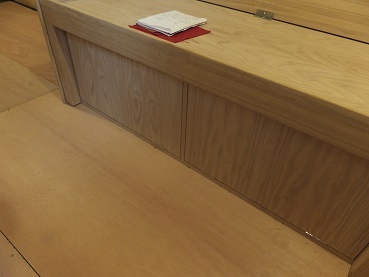 Below the painted panels, where visible, it will be clad in plain oak faced ply. 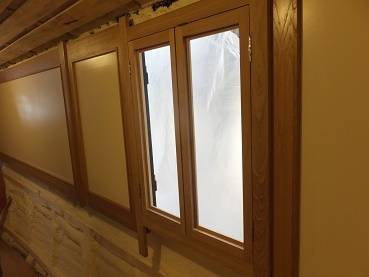 The windows have yet to be cut into the wooden cabin panels. Everywhere apart from the bathroom the liners will be oak. In the bathroom we have gone for metal liners as this will be where the most condensation occurs, which can stain wood. 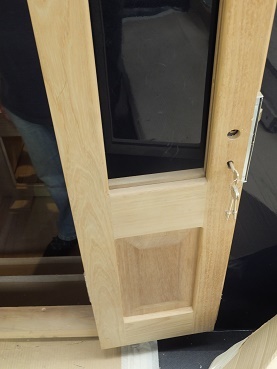 Here the glazed doors for the side hatch are shown. These sit inside and open inwards, outside the metal outer doors will close to protect these doors when it is raining and for security. 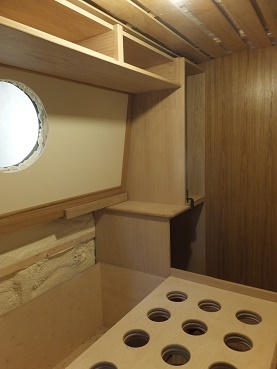 At the end of the galley the half bulkhead has been made into a 6 inch wide cupboard. This is so that I can store a drawing board and model making equipment. Being here it will be hidden away, but easily accessible when needed. There will be a lid and door on it as my drawing board will need to slide up and out of it’s storage. 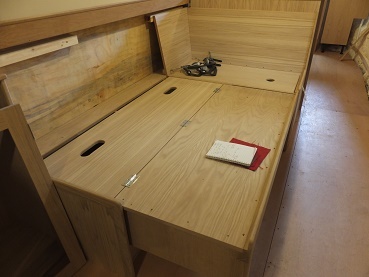 The L shaped dinette has mostly been put together. On the corridor end of the seats is a drawer for a Waeco freezer. 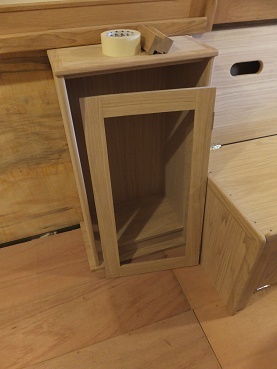 Behind the drawer there will be a storage space, only accessible if you remove the cushions. Below the longer section of the dinette are two doors that open when pushed. This means we can access storage here without having to lift the cushions. 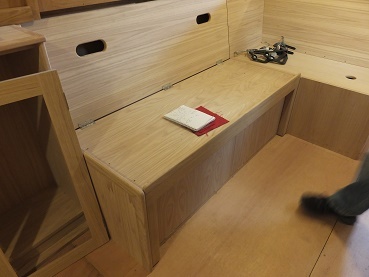 The front facia of the long side pulls out and the back of the seat flattens out to cover the storage below. The back cushion will then become part of the mattress for a double bed. This is such an easy way to make up the bed compared to what we have now. 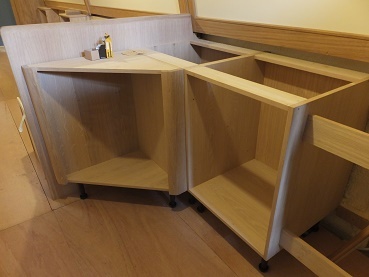 The table will fold away and be stored under the gunnels opposite the end of the dinette. At the end of the dinette is a small book case. This originally was going to have open shelves, but now we have a ships cat we need some easy access storage that she can’t access hence the door. Next to this will be a 2.5 seat sofa with a shelf unit on the other side going into the corner with the bathroom bulkhead. A little bit was lost in translation with this unit as it needs to be open to the floor below to be able to store a pouffe that will extend the sofa into a single bed when pulled out. In the bathroom some of the blue laminate was in position around the quadrant shower tray. In the opposite corner there is no floor as yet as this will be where our urine tank for the toilet will be. We did some research into calcification of urine, a steel tank would be fine unless you needed to clear any blockage. The best solution to this is to use some acid, which over time would eat away the steel, so we are having a plastic tank which won’t be affected by acid. Better safe than sorry in a few years time! The tank would last Mick and myself about four days, although we’d empty it long before then. But it will give us capacity for when we have visitors, so that we won’t have to be emptying it every day. Then the bedroom. The porthole opening has been cut away above the bed. Carcasses of the cupboards by the bow doors were in position along with cabin steps. 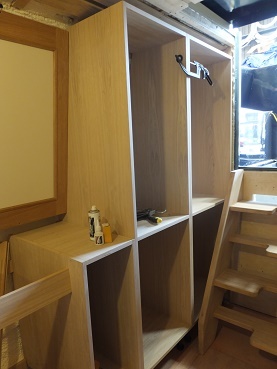 These cupboards will mainly be shelved, but one will have some hanging space that goes down below the steps. Not much need these days for hanging long dresses. I suspect most of this cupboard will end up being used for folding chairs etc. The opening facing away from the bow doors is where our vacuum cleaner will live. On this side of the bed at floor level will be the washing machine. This is mirrored with a narrower cupboard on the other side of the bed. There is a ledge big enough for a mug and books on both sides too. 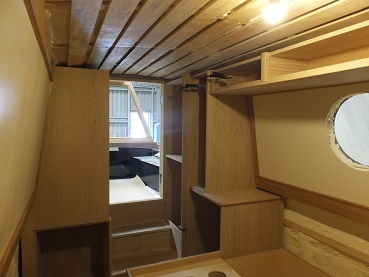 Three thin cupboards span the width of the bed above the porthole. These are likely to be used for bed linen. All the holes are ventilation under our mattress. This is the cross bed. The open section at the back will be for deep storage, winter clothes and duvets, maybe work things. 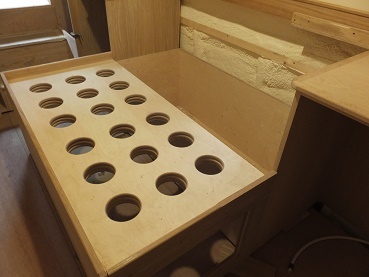 Under the holes are two large drawers at floor level, one each side of the bed, his and hers drawers. 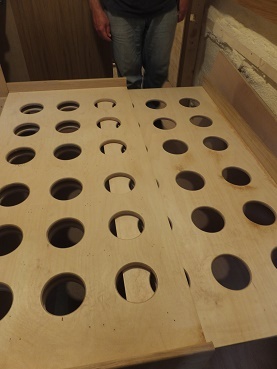 The holey bit is two layers, the top one pulls over to span the boat to make a cross over bed. The mattress on this will have a hinged section that we fold over during the day and push the base back in to create a corridor. Looking out through the front doors the cratch wood work is complete. The well deck on Oleanna is higher than on NB Lillyanne, so we will have to stoop more when the cover is on out there. I suspect on fine days the cover will get rolled right back so that there is more head height. Front doors looking rather fine with an inset of darker wood in the bottom panel. The lock looks good and has two more keys than our current front door has. Although when we returned to the boat later the doors and surround had been removed. I suspect they will stay like this for a while to make it easier to get things in and out of the boat. The front doors in situ with the cratch in position. After discussing various things inside we sat down to discuss the electrics. Two meetings ago I had produced our plan for lights, switches and power sockets. This was our suggestion based on how we live currently. Last time we had visited positions of switches was discussed, but there wasn’t enough time to go through everything. Today it had to be done, otherwise it would start to hold everything up. One or two reductions in the number of light fittings, but mostly it is how I had drawn it. Positions for switches and Cat 5 sockets were discussed. With some hunting on the internet I have since found some chrome Cat 5 covers so they won’t look too out of place. Confirmation of appliances is needed soon. Very sadly the cooker we were wanting will not be possible. We had chosen a 600 deep cooker with a lid, but forgotten that positioning it on the side of the boat would not work due to the gunnels. So we have a mission to find a cooker without a lid that will fit our needs and position. If this had been pointed out earlier the galley would have been designed differently. A similar cooker to our current one is not on our cards as we haven’t had Yorkshire puddings for two years and I dream of having them again with a Sunday Roast. This entry was posted in Uncategorized on 28th Jul 2016 by pipandmick.